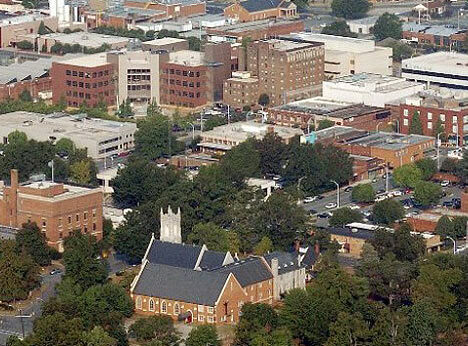 Burlington the 17th largest city in North Carolina. Originally the center of commerce for Company Shops, the downtown area still serves as the heart of today's community with financial services, government services, an expanded library, small shops, eateries and a restored theater. Downtown has also returned to its status as a major employment center, becoming the home to Laboratory Corporation of America, one of the world's largest biomedical testing firms and Burlington/Alamance County's largest employer. Burlington has 322 restaurants located throughout the city; popular ones including Zack's Hotdogs, Blue Ribbon Dinner, and Mykonos Grill.